Well, do you want the good news first or the bad news? Okay, I'll give you the good news first. 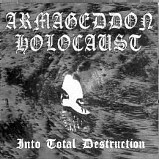 "Into Total Destruction" is an album full of raw, primitive black metal. No keyboards here. This is extreme black metal that is somewhat of a cross between Horde and older Kekal, that actually leans more towards Kekal musically since they are also from Indonesia. Vocally I'd say it's much more akin to Horde, but not quite as good. This is lightening fast black metal that paints a haunting and dark picture throughout. Now, I'll leak in some of the bad news. Firstly, they use a drum machine. I can handle listening to a drum machine, but I'd much rather hear a real human. One of Horde's strongest points was the drumming. The drum sound on that record was amazing. Unfortunately, Armageddon Holocaust can't claim that fact. The drum machine is better than no drums at all, but they don't do it as good as Kekal does (who uses a drum machine very well actually). It just really gives a fake sound to the album at times. Sadly, that is not the worst news. The worst news is that the production is very weak on this album. Some songs are better than others, and truthfully, I like a somewhat weak production on this style of black metal. However, a couple of the songs are downright horrid! "Destroying the Destroyers" starts the downfall right in the middle of the album. I've heard worse, but it's still really bad. The guitar tone is very annoying. Next up is an instrumental "Countdown to Destruction". How prophetic!! I was actually counting down the seconds to when I was going to destroy this album! This song has nasty bad production. I turned the treble ALL the way down and it still was ringing in my ears. If this kind of bad production is supposed to help black metal then hand me a hammer, cause I'm gonna smash this disc. How can you produce at least listenable songs on the rest of the album and then put garbage like this in the middle? Just leave it off in my opinion. Even though it's an instrumental there is something going on in the background. Sounds like a high-pitched black metal belching contest! No joke! Don't even bother with this song, hit the skip button. My brother's old band recorded better sounding songs on a boombox! It sounds like it was recorded in a drainage pipe or something with a little miniature hand held recorder. Anyways...despite my numerous gripes on those two songs, the rest of the album I like. At least 10 out of the 12 songs are enjoyable. Don't get me wrong, this album is still worth getting, it's just that when you have a 29 minute album and you basically waste 2 songs, that doesn't leave much room for doing something good.